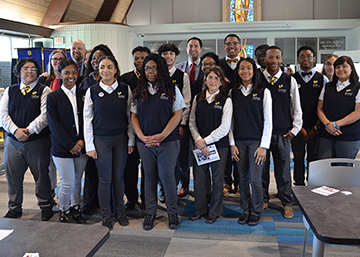 Students got a hands-on lesson in how Ohio votes when Secretary of State Frank LaRose visited DePaul Cristo Rey to talk about the importance of voting and voter registration. Staff from the Hamilton County Board of Elections also set up and demonstrated the state’s new voting machines, offering a mock ballot for students to complete and then scan into the new machines. The students are juniors in DPCR’s AP Government class and most will be eligible to vote in the coming year. Secretary LaRose expressed the critical need for young people to be part of the electoral process and took their questions which ranged from inquiries about the security of the voting system to Mr. LaRose’s own education and career path that led him to run for office.